Format reviewed: E-book (mobi), 2nd ed. Henry Schmitt wants nothing more than a quiet life and a daily ration of instant noodles. At least until he learns the terrible secret that drove his father away the Plague that killed his mother and ravaged his country was created by those now in power. His only chance to expose the truth is through a ragtag band of outlaws who knew his father and an airborne radio broadcast, but he’d have to dig into his family’s past and risk the wrath of a corrupt government. 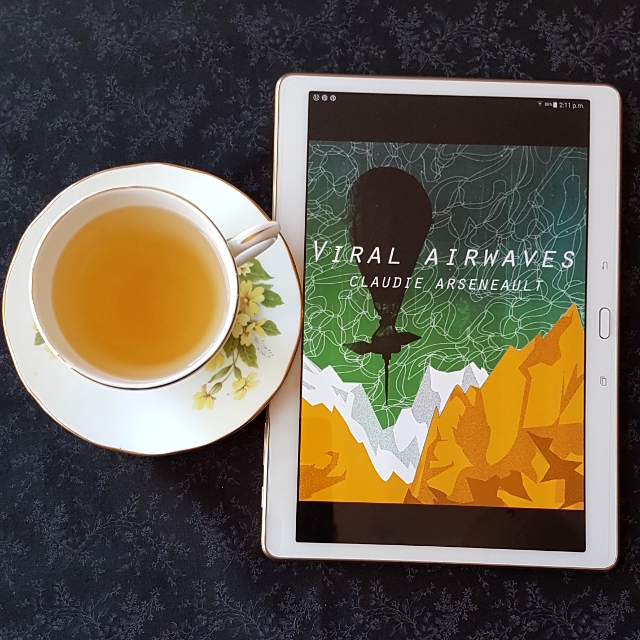 Viral Airwaves is a standalone novel sitting firmly between dystopia and solarpunk and centering LGBTQIAP+ characters. If you love hopeful stories about overcoming desperate odds, nemesis working together, and larger-than-life characters, don’t miss out! Viral Airwaves is not a romance. Nevertheless, I wanted to include some representation of asexual characters in my reviews for the Read My Valentine challenge. Viral Airwaves turned out to be an excellent choice because while it’s not a romance (at least not in the strict genre sense), relationships are at the heart of the book. The story is told in close third person from the perspective of three characters. Each character is flawed, but likeable… though not always at first. Henry Schmitt is our entry into the story. He’s one of the last occupants of a town dying after its tourism trade dried up. He just wants a quiet life and he’s ill-equipped to deal with the disruption when he gets swept up with a gang of rebels who knew his father. These characters view him as cowardly, and perhaps he is. Henry’s desire for normalcy and his tendency to eat when stressed made him very relatable, even as I was cheering for him to grow beyond these. He’s one of two asexual characters mentioned in the book and the only one that gets time onscreen. However, much like his stress eating, this part of his character isn’t framed as a defining characteristic, but is rather simply part of the background. Diversity of race and sexuality is likewise a casual part of the story throughout. The second POV character is Andeal, an electrical engineer who is one of the founding members of the rebellion. He’s an important friend to Seraphin, the leader. He was also imprisoned with Henry’s father, and the pair were experimented on by a government scientist. The result for Andeal was blue skin and an overriding fear of being imprisoned again. This fear provides an interesting counterpoint to his incessantly (and sometimes foolishly) optimistic personality. The last POV character is Captain Hans Vermen. He deserts the army in his quest for vengeance against Seraphin for killing his brother. Hans is xenophobic and has some strongly internalised homophobia. At first glance, he’s a repulsive character but he became one of my favourites as I discovered his motivations and watched him struggle with his prejudices. In fact, it was a joy to watch all of the characters battle with their flaws and make new connections with other people. It is never specified whether the story is set in our world or some close parallel. What is clear is that the world has been through some kind of apocalypse. Bacteria has destroyed the world’s oil supply and the population has been decimated by a plague. Oil-driven technology has been replaced: solar panels abound and government vehicles are all electric. Mass media has been reduced to radio, which is controlled by the authoritarian government who came into power in the wake of the plague. The setting feels at once modern and old-fashioned. While this mostly worked there were a couple of places where it jarred. The pace is quite slow, particularly in the beginning. However, this was important for establishing the relationships that are at the heart of the book and there were occasional bouts of action that helped keep things moving forward. The story bills itself as a hopeful one, but readers should be warned it gets dark in places. There is torture and character death, so tread with caution. Overall, Viral Airwaves was a thoughtful, character-driven storythat drew me in and kept me turning the pages. Excellent, thanks for the rec! With all the conversations around Riverdale and ace/aro rep, I’m wanting to definitely read more books with that rep.
My pleasure! I got the rec from Lynn O’Connacht via her post on ace spec Own Voices. You might find a few other recommendations there that suit.